A multiple pregnancy is when a woman is pregnant with 2 or more fetuses. Twins are the most common type of multiple pregnancy. This type of pregnancy can have a higher risk of problems during and after pregnancy. A care team can help to decrease these risks. If there are 3 or more fetuses they may be identical, fraternal, or both. Women over 30 are more likely to have a multiple pregnancy. Pregnancy itself does not need treatment. Your care team will watch for possible problems. Regular visits with your care team will help to keep the mother and baby well. Most multiple births will end before 37 weeks of pregnancy. Babies born preterm have a higher risk for many health problems. Bed rest or medicine may help to delay early birth. Medicine may also be given to help the baby's lung mature if labor may start before 34 weeks of pregnancy. Gestational diabetes is a high level of blood glucose during pregnancy. It can affect both the mother and baby's health. Treatment can help to return blood glucose levels to normal. It may include changes in diet, exercise, blood glucose level testing, and medicine. Preeclampsia is a fast and dangerous increase in blood pressure during pregnancy. Treatment may include medicine, rest, and delivery of the babies. More than 1 fetus in the uterus increases the chance that 1 of them will be unable to turn head down. 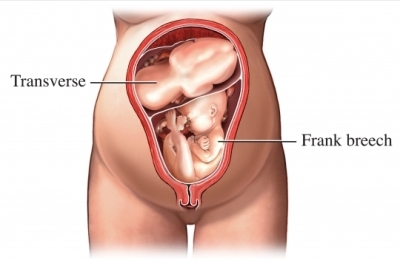 A breech or transverse presentation increases the chance of needing a cesarean delivery. TTTS may happen with identical twins. Fetuses can share a tube to the placenta. If this sharing is unequal, TTTS can develop. One twin gets less blood. The other may end up with too much blood and fluid in the body. It can affect the health of both babies. Fetus growth and heart beat will be closely watched. Multiple fetuses are more likely to have growth issues. Sometimes, one may be much smaller than the other. This can be normal or signal a problem. Growth will be carefully watched. The risk of c-section is higher with more than 1 fetus. Women will also have a higher chance of heavy blood loss after giving birth. Multiple pregnancy with natural conception can not be prevented. Fertility treatments can lead to a multiple pregnancy. The care team will work to make sure the number of possible pregnancies is safe. American College of Obstetricians and Gynecologists (ACOG), Society for Maternal-Fetal Medicine. ACOG Practice Bulletin No. 169: Multifetal gestations: twin, triplet, and higher-order multifetal pregnancies. Obstet Gynecol 2016 Oct;128(4):e131, reaffirmed 2016. Multiple gestation. EBSCO DynaMed Plus website. Available at: http://www.dynamed.com/topics/dmp~AN~T113875/Erectile-dysfunction. Updated November 26, 2018. Accessed January 8, 2019. Multiple pregnancy. American College of Obstetricians and Gynecologists website. Available at: http://www.acog.org/Patients/FAQs/Multiple-Pregnancy. Published July 2015. Accessed January 8, 2019.